The Development Centre of Science and Technology (DCST), Ministry of Agriculture, People’s Republic of China, and the Community Plant Variety Office (CPVO) have decided on 15 November 2017 to initiate technical cooperation in the area of plant variety rights. The DCST is the Agency under the Ministry of Agriculture responsible for registering plant variety rights for agricultural and vegetable crops and for a range of fruit and ornamental species in the People’s Republic of China (PRC). 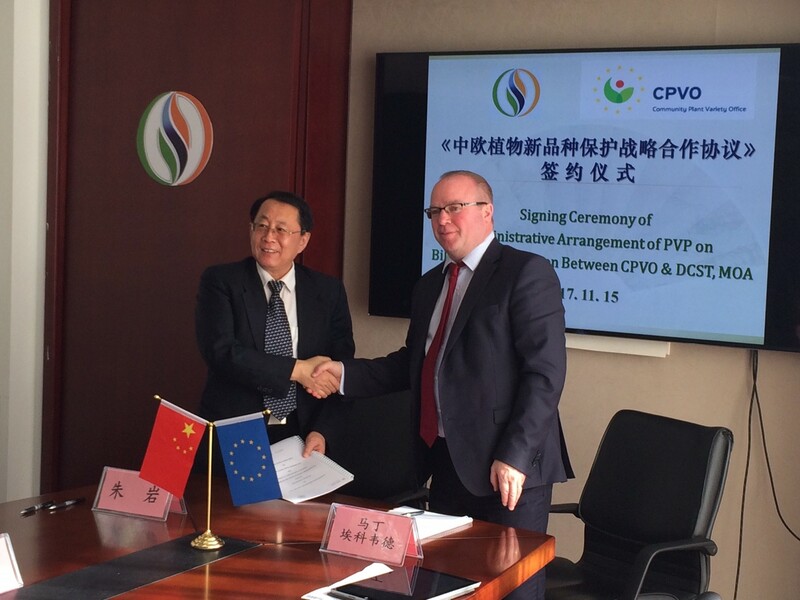 The CPVO is the European Union Agency responsible for registering plant variety rights in the European Union. The DCST and the CPVO operate in the field of plant variety protection (PVP) with similar operational structures and process a comparable volume of applications. The cooperation activities to be performed under the administrative arrangement (hereinafter the “AA”) with a duration of three years (2018-2020) would contribute to creating synergies between the DCST and the CPVO in different operational and administrative areas. Exchange of best practice and technical information with the aim of closer international harmonisation is hoped to encourage breeders to make new varieties available and will offer farmers and consumers a better access to adapted varieties meeting their needs. Activities would involve training in Distinctness, Uniformity, Stability (DUS) tests of the staff of the DCST and CPVO in the respective territories, i.e. the DUS Test Centre for Plant New Variety Protection, the Ministry of Agriculture and its sub-centres in the PRC, and entrusted examination offices in the EU. Where appropriate, the CPVO will also involve other stakeholders such breeders' organisations. One of the main purposes of this AA is to enhance the environment for breeders to acquire PVP in the EU and in the PRC through the establishment of wide-ranging and flexible mechanisms for guiding and furthering mutual cooperation in the areas. The AA is also intended to facilitate the PRC's potential move towards acceding to UPOV ’91. Explore and share enforcement-related practice. The DCST and the CPVO will bear their own costs arising from any activity implemented under this AA, unless otherwise arranged separately in writing. The DCST and the CPVO may decide to review the cooperation activities deployed under this AA and to evaluate their implementation. The evaluation may include identifying areas in which cooperation should be strengthened, improved, suspended or terminated and new areas for joint action. The EU PVP system and the Chinese PVP system are number one and two in the world in terms of the number of applications received each year. This emphasizes the importance of the project.